This Friday 16 December at 08:00 UTC, BitMEX will launch the 31 March 2017 Bitcoin / USD (XBTH17) and Bitcoin / CNY (XBCH17) futures contracts. Given the recent highs that Bitcoin has reached in terms of price and market cap, there is excitement building surrounding the launch. The premium traders will pay to go long for three months represents the cost of unsecured USD, counterparty risk, and the bullishness of the market. There are several trading strategies that can be employed. The simplest strategy, is to buy spot and sell futures to earn the basis. Remember, basis is the difference between the futures and spot price. Basis represents the cost of funds to buy Bitcoin using leverage. Arbitrageurs utilising this strategy effectively lend USD to speculators. Capital is finite. Unless you plan to trade the basis, once the trade has been put on, it must be kept until expiry to earn the basis. The trick is to predict when during the life of the contract the outright basis will be the highest. The above is a time series chart of the outright % basis between the Bitcoin / USD futures contract, XBTZ16, and spot. XBTZ16 was listed on 26 October 2016. Observing the chart, putting on the trade closer to the listing date, meaning when it has the greatest time value, generally gives the greatest outright returns. There are spikes during periods of high volatility, and when the price is rising. Of the capital allocated to this strategy, use 50% within the first month of listing. Divide the remaining 50% into two tranches, and opportunistically employ the strategy during aggressive price spikes. If the past is any guide, an outright rate above 5% is to be expected. If the rate rises above 6%, consider that a good opportunity to deploy any dry powder. More sophisticated traders can play the curvature of the term structure. The XBTUSD swap charges a funding rate to longs or shorts every 8 hours. This is a variable interest rate which depends on whether the swap trades at a premium or discount to spot. Longs pay shorts if the swap is at a premium, shorts pay longs if it is at a discount. Traders who believe the XBTH17 basis is underpriced, can employ a curve steepening trade. They would buy XBTH17 futures vs. sell XBTUSD swaps. The Bitcoin / USD risk is eliminated, and what remains is a pure curve trade. 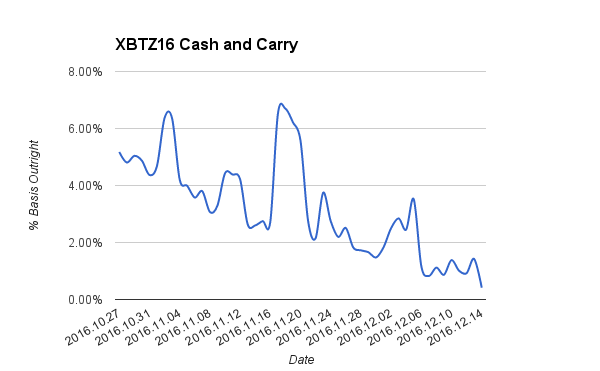 If the XBTH17 basis increase is larger than the net funding being paid to a long XBTUSD swap holder, then the trade is profitable. Traders who believe the XBTH17 basis is overpriced, can employ a curve flattening trade. They would sell XBTH17 futures vs. buy XBTUSD swaps. If the XBTH17 basis decline is larger than the net funding being paid to a short XBTUSD swap holder, then the trade is profitable. As a point of reference, cumulatively since the May 2016 launch of XBTUSD, longs have paid shorts 30.74% outright (51.96% annualised). Assume from now until expiry of XBTH17, XBTUSD will have the same annualised variable funding rate. That would mean a break even outright basis of 14.95% would need to be earned by shorting XBTH17. The PBOC is expected to accelerate the devaluation of the Yuan in response to the Fed’s more hawkish tone. In the past, this lead to an expansion of the premium between XBT/CNY and XBT/USD. The devaluation process will not happen overnight. The Bitcoin market will not fully price in a substantially weaker Yuan until it actually happens. When XBTH17 (Bitcoin / USD) and XBCH17 (Bitcoin / CNY) open, a suitable trade would be to go long the China Bitcoin premium. To go long the premium, go long XBCH17 vs. short XBTH17. The Bitcoin risk is eliminated. What remains is a pure China Bitcoin premium play.